Top Best Websites to Play Games Online – Must Try! Hello friends, Today I will tell you a method on how to change Android Home Screen. You can change the complete design of your Android home screen. Users can completely customize Home screen of their Android device. You can reset home screen layout on your Android Phone. You can use this method on almost every Android Phone. This method will work on Samsung Galaxy, Motorola, and all other Android devices. Most of the Android users get bored by watching the same home screen of their Android smartphone. Android smartphone can be customized easily according to the user. However, changing the home screen in any Android phone is one of them. So, in this article, we will see some method and techniques to change Android home screen. Using these mentioned steps any Android smartphone user can quickly change Android home screen. Let’s have a look at the method which I have mentioned in this article. To customize home screen of an Android phone you have to tap and hold the home screen of your Android phone. When you will do this task for at least 2-3 seconds, then you will be able to see the options that are Wallpapers, Widgets, Settings, and more. These options may vary according to the other brand of Android phones. However, any Android user can customize home screen using these options. A user can change the wallpaper, add widgets, change the layout, and much more. So, what you are waiting for? Go and do it now to customize home screen of your Android phone. This is the time to change Android home screen. Now, we are going to check some amazing methods to change Android home screen. If you are willing to change the home screen of your Android phone, then this guide is for you. 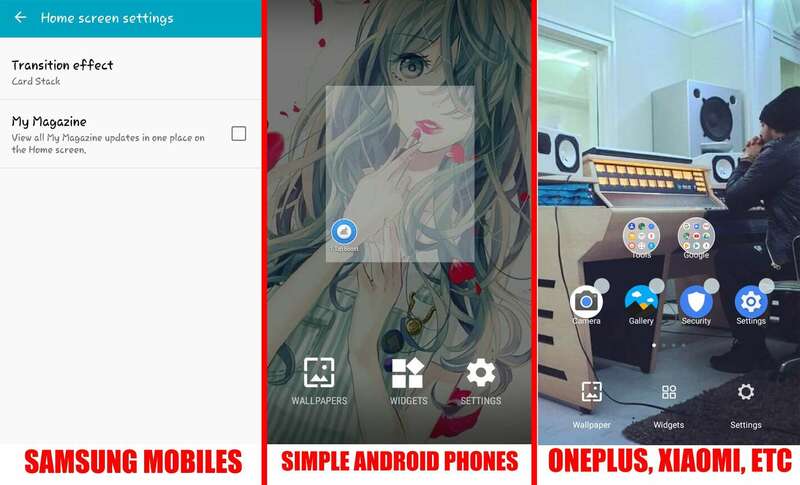 In this guide, I have used a well known third party launcher to customize and to change Android home screen. After using this application, you are going to see a stunning look on your Android smartphone. Apparently, this Android launcher app is available on Google play store. So, without taking more time let’s go through the guide. Get the Go Launcher app from the Google play store. Install it as you install other applications. Now, open it and start setting it up. After setting up, you will see the Settings options on the home screen. Now, use the Settings of Go Launcher app to change Android home screen. In this way, you can change Android home screen. These are the best method which can help you in customizing the Android phone without facing any trouble. However, if you want to use a few settings to change Android home screen. Then you can do it without using the Go Launcher. But, if you want to give your Android phone a pretty new look then, of course, you must use the Go Launcher app. This app is a well known and trusted app that is why I have shared this Android app with your guys. Make sure that you share this article with your friends and help them to change Android home screen of their Android phone. Crazy Android Tricks © 2017 - 2018. All Logos & Trademarks belong to their respective owners. Android is a trademark of Google Inc.